Michael Laverty in action in Sunday's British Superbikes round at Cadwell Park. Picture: Bonnie Lane. Michael Laverty missed an opportunity to strengthen his position in the top six of the MCE Insurance British Superbike Championship at the weekend. The Toomebridge rider had continued his steady progress with a fifth-placed finish in Sunday’s opening race at Cadwell Park. But he crashed out in the second race, failing to add any more points to his season’s tally. Laverty is currently in sixth position with 105 points, 21 points ahead of Dan Linfoot in seventh place. 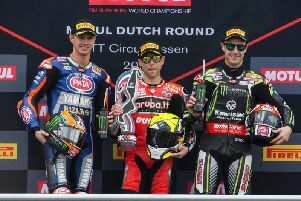 The top six riders in the standings go on to reach the Showdown Zone format of the championship.